Somerset Public Health(SPH) has worked with each community including Jackman to: develop tobacco and substance use policies, completed Rural Active Living Assessments and planning, written Food policy and procedure manuals for their Food Cupboards and assisted with resources for these sites, provided assistance in establishing Senior Gathering sites to reduce social isolation, assisted with establishing local transportation both for public transportation and health care rides, conducted focus groups and community wide assessments to identify senior needs for aging in place, offered evidence based trainings (NDPP, Living Well, Cooking Matters, 10 Tips, Supermarket Tours, Move More, etc). Redington Fairview General Hospital (RFGH) offers, health care services, prevention and rehabilitation program services, Emergency Medical Services and support groups for patients. The Senior Gathering places will act as the community task force, we have a county senior strong committee of agencies who serve seniors with community task force members on it to guide the county wide efforts in addressing age friendly communities and senior health needs which may be falling through the cracks of our system. 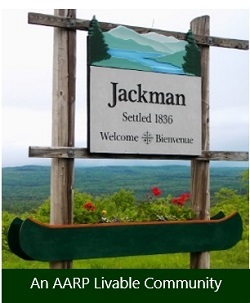 Older people in Jackman are already engaged in Senior gatherings, they serve on the county Senior Strong Committee, food cupboards, municipal government, our local hospital has both a volunteer organization of older adults and a nurses auxillary. Many of our agency programs such as meals on wheels and RSVP have older adults volunteering and already out across our community. Our work to date involved training older adults as facilitators for focus groups and conducting interviews to conduct their own local assessments and we will continue to use this process with the addition of other community members including youth as a major source for gathering, reviewing and presenting their community data to move community action plans forward.